Holidaying with the family is one of my favourite things in the world, so even when the finances may not be in my favour, I still keep a close eye on travel deals… just in case. And that is exactly how we ended up on our latest mini break. Not a day goes by that I don’t get at least a couple of travel related emails in my inbox. I don’t always open them, but sometimes curiosity gets the better of me and this time it was WotIf that got my attention. 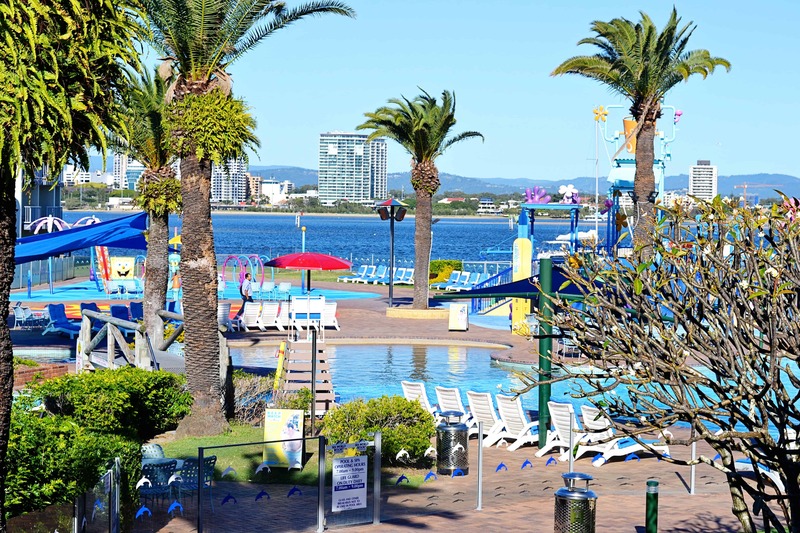 Half price accommodation at Seaworld Resort Gold Coast, including unlimited theme park entry. Oh yeah! And in case you haven’t heard of WotIf, it’s an accommodation deals website that compiles a list of lots of different offers and rates for various accommodation in one place. Saves you searching individual accommodation websites, plus you can do all your booking online which is my preference. It is just one of the deals sites I use when booking accommodation. You can also find lots of other coupons for discount travel and other services,which includes WotIf and Expedia Coupons, to help you save even more. So we considered our options – go before the baby arrives (but not too close to due date) or go after. We decided before was the safer option as you just never know what may happen. So we locked in Mother’s Day weekend as our travel dates… kind of by accident but it worked out well as it meant I scored myself a weekend away to the Gold Coast plus lots of fine dining for Mother’s Day weekend. This wasn’t the first time we have stayed at Seaworld Resort Gold Coast, although it has since had an upgrade to the rooms and facilities. It’s a fantastic resort for families, with its own mini water park in the pool area, plus seasonal entry to extra water slides. Plus being that it is linked to Seaworld theme park, there are of course those perks, like morning meet and greets with the kids every morning in the foyer – mega perk if you don’t actually have a theme park add on with your accommodation. Or even if you do… because they have more one-on-one opportunities. The pool was actually heated to 23 degrees during the off peak season, so still lots of people swimming. Not us. 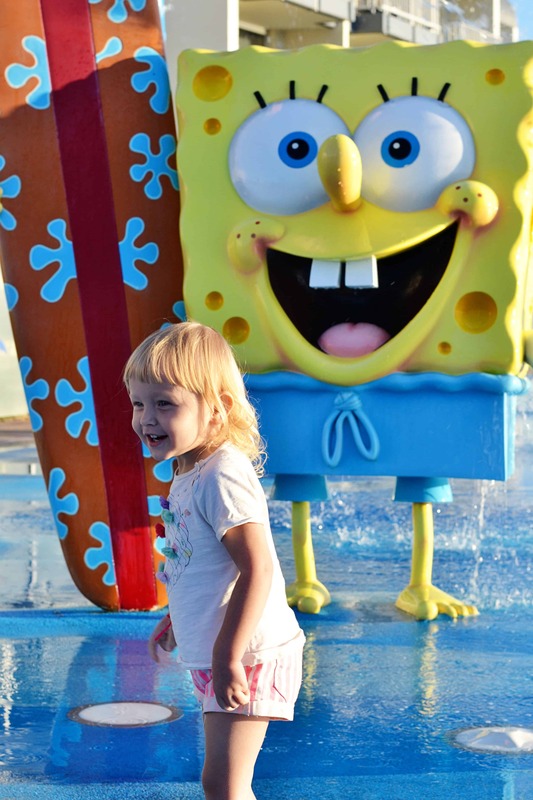 But we did have an afternoon play in the SpongeBob water activity area, which has lots of water jets and cute visuals. Plus at 8pm every night, there is a light show where the water jets are lit up different colours and music plays. Such a fun experience for kids. 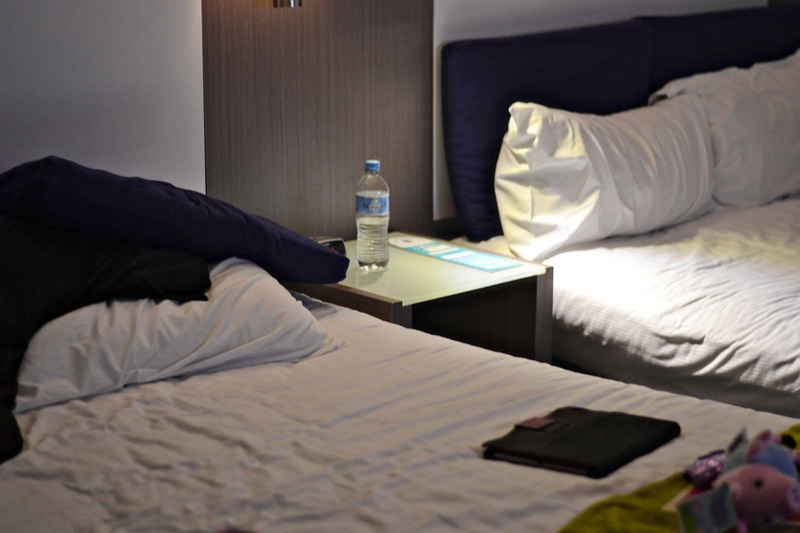 The rooms are a comfortable size and even the cheaper room rate that we went with has 2 double beds. Last time we tragically ended up having a bed each the first night… a bit sad for a ‘romantic weekend away’ but this time the two doubles were very useful for our co-sleeping little miss and a pregnant mamma that needs her space. There are several restaurants and casual dining options at the resort. Actually… a crazy amount of them to suit all budgets, from the very fine dining of the seafood buffet and Japanese restaurants, to the poolside cafe. Our accommodation deal also included 25% off all resort dining. For us, the theme park thing was a little pre-baby treat for our daughter before her sister arrives. So not the usual crazy ride filled day, with her being 2.5 and me being 37 weeks pregnant. But Seaworld has so much to appeal, with lots of animals and shows to watch. Unfortunately the young kids amusement section was shut for an upgrade. 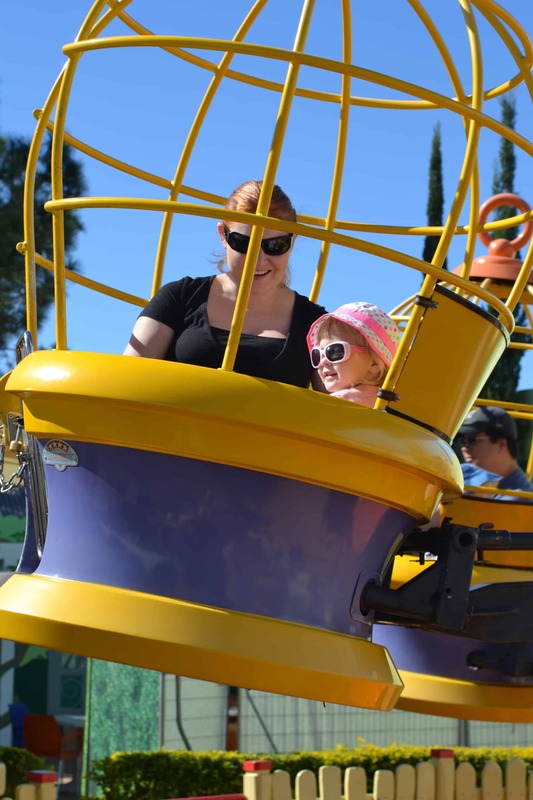 Movieworld was great fun for our little one too, with several rides suited to her age group and she actually really loved the Stunt Driver 2 car show. Overall, we had a fabulous weekend of fun and family time for our combined babymoon and Mother’s Day weekend away. Our little miss had a blast and was of course exhausted by the end of the weekend. She is a great little traveller though thankfully. We will certainly be heading back to Seaworld Resort & Water Park in future, as it will be a great place to stay every couple of years to treat the kids. Sounds like it was a lovely break. I haven’t stayed at Seaworld since I was 13 (over 20 years ago)! I think I may have to put this on our list for when our little girl turns 2 in September. Yes, she will love it. 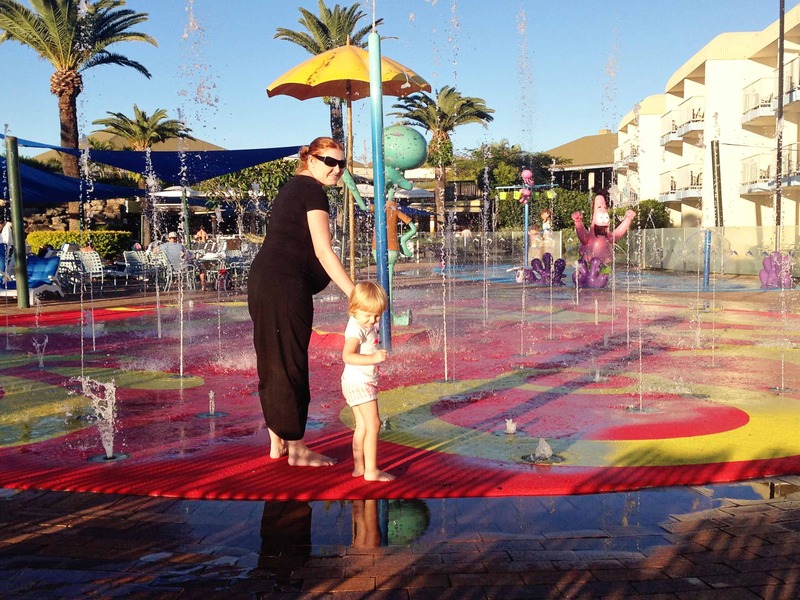 It’s such a fun place to stay for kids and if you wait until it’s warmer, at least she will get to run around in the water jets near the pool area, just perfect for the little ones. My daughter was shivering but still insisted on having a little play. It’s such a fun family resort. Great Seaworld Resort & Water Park information! They are very useful! Find some coupons and deals before you book the travel, it will help you save much money.